Almost as good as a magic Glockenspiel: the Met's electronic brochure for the 2010-11 season! I expected this to be merely an electronic version of the publication which my mailbox so eagerly awaits, but no! it is more! Over 70 pages of exciting pictures and production details are augmented by audio clips and video excerpts! I have resisted the temptation to listen and watch from cover to cover, but among other gems, this contains Garanca-for-Alagna's "Seguidille," which is one of the sexiest I've seen. It also contains provocative quotes like Willy Decker's assertion that Violetta is the only character of La Traviata "who truly loves, selflessly." Hmmm. But if Alfredo doesn't love her selflessly, the opera is so much less emotionally satisfying/devastating! She does come off best, there's no denying it; and one could make much of "Amami, Alfredo! Amami quanto io t'amo!" All the same, isn't it best if we believe all three of the principal characters when they lament their partial culpability in the third act? I'd be interested to see a production with an "Alfredo is actually rather pathetic and projects as much on to her as everyone else, just in different ways" slant... but at least at this moment in time, the "tragedy unleashed by misunderstandings (and consumption)" version is dearer to my heart. On Wednesday, I went down to Lincoln Center and failed, for the first time in all my attempts, to get a rush ticket. However, there's nothing like standing on a line for a couple of hours to put me in the mood for an opera (what else is one going to do but read the libretto and talk to one's neighbors about memories of past performances, and hopes for this one?) so I trekked back up to my apartment and defied the piles of books by curling up with wine and Puccini. And I was reminded: yes, I really, really do like La Boheme. Maybe it's partly because I recognize far too much of Benoit in my own landlord that I never tire of spending time with the Bohemians. Never does verismo (which surely ought to be translated "verisimilitude," rather than "realism"?) seem quite so credible as when detailing students who are stretching their budget, stretching their pockets with secondhand books, sticking Latin words into their conversation as often as they can, and of course, complaining about work. Eerily familiar, really. It's a bit of a tangent from opera, but J.S. Bach, I believe, should always be shared. 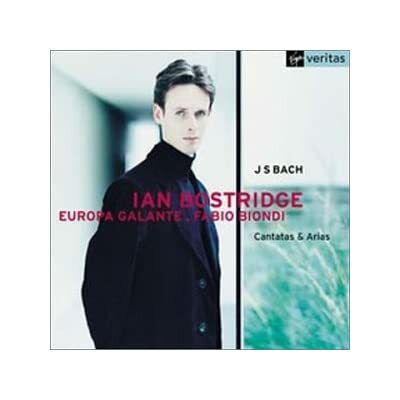 In an effort to surround myself with music appropriate to Ash Wednesday, I checked out from the local library this CD of Bach cantatas and arias by Ian Bostridge, a singer who had been on my "to investigate" list for a long time. (I'm only a few years behind music reviewers everywhere in my "discoveries," it would seem...) I'm glad I did. Bostridge has a lovely, clear sound, and exquisite diction. I thought he did a nice job with the emotional range of the pieces, too. Here you can listen to him singing BWV 82a, "Ich habe genug," which has long been a special favorite of mine. The florists of New York City are overflowing with bouquets of all sizes and, it seems, every imaginable shading of aesthetictaste or lack thereof. German and Swiss chocolates are excitingly prominent in drugstores. Couples wander shamelessly embracing. Young men and maidens can be overheard anxiously or eagerly speculating on how various gestures will be received by the object of their affections. On this Valentine's Day, I have been sitting in my apartment doing work for the coming weeks (le sigh), and thinking about love in opera. First love, fading love, impetuous love, love of slow growth, unrequited or instantly reciprocated, touchingly innocent or sexually obsessive... que nul ne sait apprivoiser. On Wednesday I ventured down through a fine snowstorm to secure rush tickets for "La Fille du Regiment"; what better way to celebrate being snowed in than by going out to the opera? Having seen the production once before with Florez and Dessay (Vienna 2007), I was most excited to see and hear Diana Damrau live at last. I was not disappointed: the vocal fireworks of the part, while not heavily ornamented, were completely solid, and her characterization was fearless, extending to sobs and shrieks of pique or delight. She charmed the house, and developed Marie's character touchingly over the course of the evening. At this point in Juan Diego Florez's career, enough is said when it is said that his ardent Tonio did not disappoint. (And if you somehow have missed hearing his Tonio, go here now to see the role's vocal centerpiece in the Met/ROH/Vienna co-production which is finishing up at the Met this week.) I never fail to be drawn in by his energy on stage, and he and Damrau made an irresistible duo. To start this post off, yet another Shameful Confession: Rigoletto had until this week belonged to the category of Great Operas which I didn't really connect with. I would have had far less shame if my confession were "I strongly disliked Rigoletto..." followed up by musically and dramatically justified reasons. But I just didn't connect. It seemed disjointed: a charming Duke who alienates powerful men while remaining surrounded by toadying courtiers, a jester who is the abused underdog but seems like a horrible person, a "trusted nurse" character who can be bought off with a single gesture, a sheltered girl who takes fearlessness even from feigned love. Oh, and a man with a curse. One minute carefree choruses, the next dramatic imprecations and impending doom... I just didn't get it.